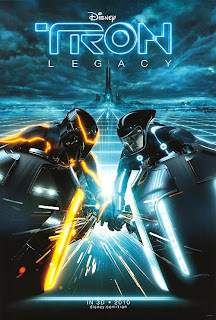 Only 28 years after the original Tron hit movie screens we get it's much anticipated sequel, Tron: Legacy from Walt Disney Pictures. I really, REALLY wanted to love this movie and not just because movie tickets have hit $21 each. The original Tron, released in 1982, was a fantastic and reasonably deep story which explained the inner workings of computer hardware and software in an extremely viewer friendly manner. This movie, from first time director Joseph Kosinski, however failed to capture me in that respect. The story basically revolves around the disappearance of Kevin Flynn, once again played by Jeff Bridges. Flynn's son Sam, Garrett Hedlund, goes in search of his father, inadvertently becomes digitized and drawn into the dangerous world of killer programs and gladiator style games. The story doesn't require any in depth thought which is neither a positive nor a negative but merely a matter of personal preference, it does however leave the film feeling rather shallow and inevitably pointless. Bridges as always is charismatic and the stand-out performer in a reasonably well known cast including Olivia Wilde, Bruce Boxleitner and Michael Sheen. Sadly, only two other actors managed to gain and hold my attention, Michael Sheen and Anis Cheufra who plays the masked and deadly Rinzler. Tron: Legacy is the story of a father and son who are lost and reunited yet I still struggled to feel anything for any characters involved. By the end of the movie I simply didn't care whether or not they made it out of the program. The visuals in the film are nothing short of eye-popping. The first twenty minutes include a duo of gladiator style battles including the return of the lightcycle, new and improved, being ridden by our hero in his best bug zapper blue. Another impressive part of the Tron: Legacy visuals is the inclusion of Clu, a copy of Jeff Bridges circa 1982. At times the CGI of this character fell into Masahiro Mori's "uncanny valley" although could generally be considered to be a triumph. Everything was beautifully rendered in the classic Tron style, everything including the Walt Disney Magic Kingdom logo. The 3D effects in film unfortunately fail to add any significant depth of field and could probably have been skipped all together. One major success was the soundtrack which was supplied by French house duo Daft Punk. An incessant onslaught of retro inspired electronica pumps throughout the entire film culminating in a cameo with the robotic pair themselves. This soundtrack has easily jumped into my top 10 soundtracks of all time. Overall this film is enjoyable, visually impressive and a delight on the ears. Sadly the area in which it is most deficient is substance. I walked out feeling as though I had just watched a two hour film clip for the Daft Punk OST. This was a very pretty which was very sadly lacking in substance. If anything, I still want to see it for the Daft Punk cameo. Sadly the Daft Punk cameo was among the highlights for me. Sure it was pretty and sounded good but I really didn't give a s#!t about any of the characters.